The cost of generation of electricity will depend upon various factors such as Connected Load, Maximum Demand, Load factor, Demand Factor, Diversity Factor, Plant Capacity Factor and Use Factor (learn more about these factors). These, in turn, will depend upon the type of load and load conditions. 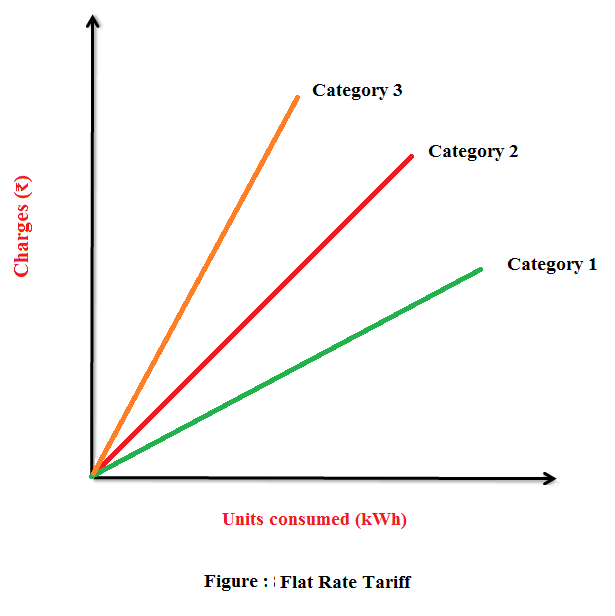 Hence, the tariff is different for different type of loads (and hence different consumers). Therefore, while fixing the tariff, we have to consider various consumers (industrial, domestic, commercial, etc.) and their requirements. Due to this, the whole process becomes complicated. The tariff should be such that the total cost of generation, transmission, and distribution is recovered. It should earn a reasonable profit. It must be fair and at a reasonable to the consumers. It should be simple and easy to apply. It should be attractive than a competitor. Keeping in mind the above factors, various types of tariff have been designed. The most commonly used are given below. 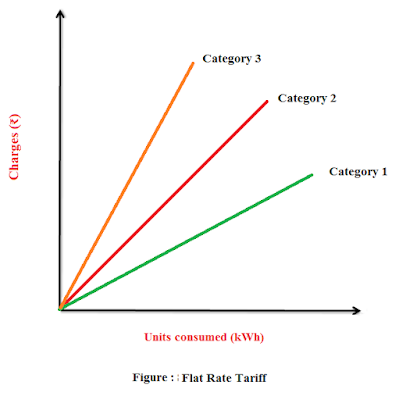 In this type of tariff, a fixed rate is applied for each unit of the energy consumed. It is also known as a uniform tariff. The rate per unit of energy does not depend upon the quantity of energy used by a consumer. 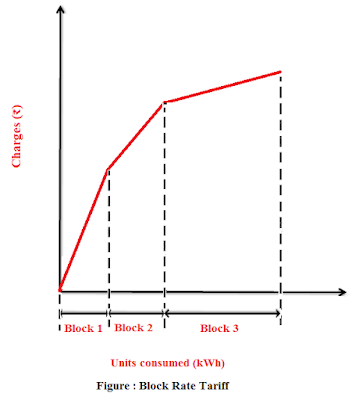 The price per unit (1 kWh) of energy is constant. This energy consumed by the consumer is recorded by the energy meters. There is no discrimination according to the different types of consumers. The cost per unit is high. If a consumer does not consume any energy in a particular month, the supplier cannot charge any money even though the connection provided to the consumer has its own costs. Generally applied to tube wells used for irrigation purposes. In this tariff, different types of consumers are charged at different rates of cost per unit (1kWh) of electrical energy consumed. Different consumers are grouped under different categories. Then, each category is charged money at a fixed rate similar to Simple Tariff. The different rates are decided according to the consumers, their loads and load factors. More fair to different consumers. A particular consumer is charged at a particular rate. But there are no incentives for the consumer. Since different rates are decided according to different loads, separate meters need to be installed for different loads such as light loads, power loads, etc. This makes the whole arrangement complicated and expensive. All the consumers in a particular “category” are charged at the same rates. However, it is fairer if the consumers that utilize more energy be charged at lower fixed rates. Generally applied to domestic consumers. 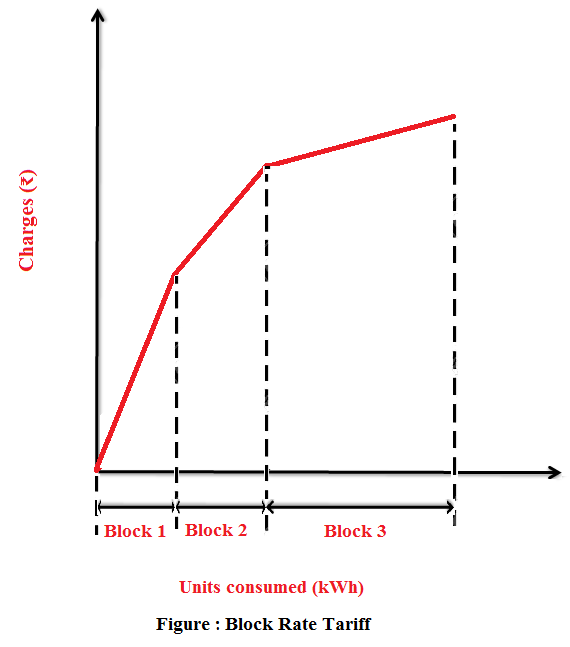 In this tariff, the first block of the energy consumed (consisting of a fixed number of units) is charged at a given rate and the succeeding blocks of energy (each with a predetermined number of units) are charged at progressively reduced rates. The rate per unit in each block is fixed. For example, the first 50 units (1st block) may be charged at 3 rupees per unit; the next 30 units (2nd block) at 2.50 rupees per unit and the next 30 units (3rd block) at 2 rupees per unit. Only 1 energy meter is required. Incentives are provided for the consumers due to reduced rates. Hence consumers use more energy. This improves load factor and reduces cost of generation. If a consumer does not consume any energy in a particular month, the supplier does not charge any money even though the connection provided to the consumer has its own costs. Generally applied to residential and small commercial consumers. Total Cost = [A (kW) + B (kWh)] Rs. The fixed charges will depend upon maximum demand of the consumer and the running charge will depend upon the energy (units) consumed. The fixed charges are due to the interest and depreciation on the capital cost of building and equipment, taxes and a part of operating cost which is independent of energy generated. On the other hand, the running charges are due to the operating cost which varies with variation in generated (or supplied) energy. If a consumer does not consume any energy in a particular month, the supplier will get the return equal to the fixed charges. Even if a consumer does not use any electricity, he has to pay the fixed charges regularly. The maximum demand of the consumer is not determined. Hence, there is error of assessment of max demand and hence conflict between the supplier and the consumer. Generally applied to industrial consumers with appreciable max demand. 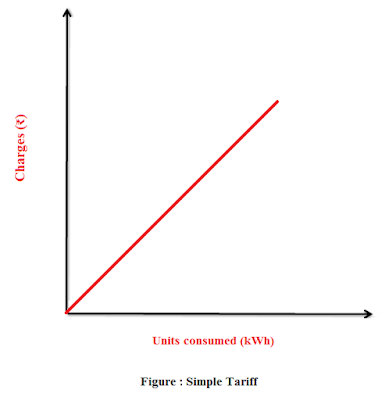 In this tariff, the energy consumed is charged on the basis of maximum demand. The units (energy) consumed by him is called maximum demand. The max demand is calculated by a maximum demand meter. This removes any conflict between the supplier and the consumer as it were the two part tariff. It is similar to two-part tariff. Generally applied to large industrial consumers. In this type of tariff, the fixed charges are made on the basis of maximum demand in kVA instead of KW. Hence, the pf is inversely proportional to kVA demand. Hence, a consumer having low power factor load will have to pay more fixed charges. This gives the incentive to the consumers to operate their load at high power factor. Generally, the suppliers ask the consumers to install power factor correction equipment. In this tariff scheme, the active power (kW) consumption and the reactive power (kVAR) consumption is measured separately. Of course, a consumer having low power factor load will have to pay more fixed charges. 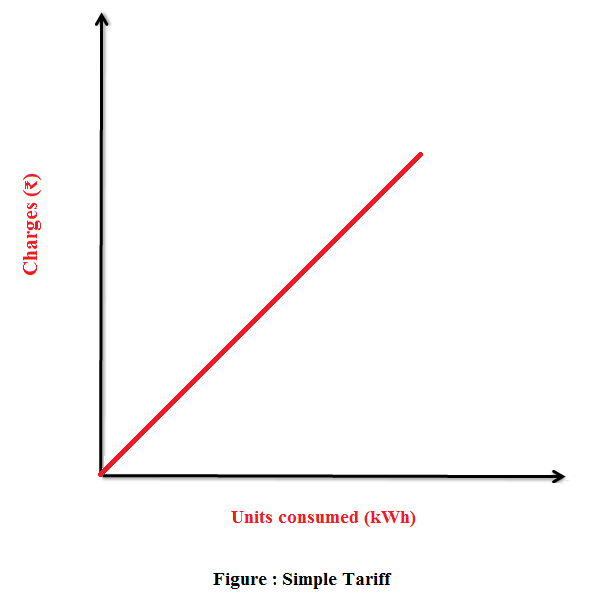 In this type of tariff scheme, an average power factor (generally 0.8 lagging) is taken as reference. Now, if the power factor of the consumer’s loads is lower than the reference, he is penalized accordingly. Hence, a consumer having low power factor load will have to pay more fixed charges. Also, if the pf of the consumer’s load is greater than the reference, he is awarded with a discount. This gives incentives to the consumers. It is usually applied to large industrial consumers. In this scheme, the total costs are divided into 3 sections: Fixed costs, semi-fixed costs and running costs. This type of tariff is generally applied to big consumers. Author: Manoj Arora is an electrical engineering student and a writer from Gujarat, India. He writes poems and short stories whenever he's not immersed in a book.